Restaurants and nightlife are a quintessential part of any university experience. 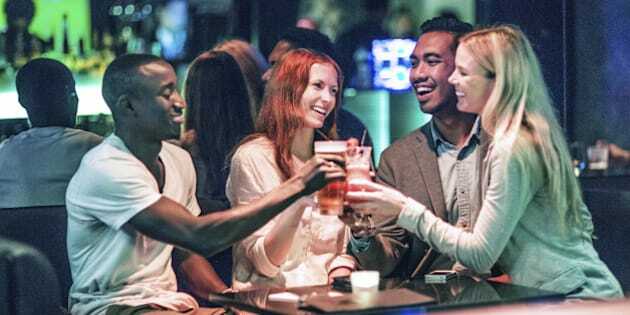 Whether your scene is eating homestyle stew or sharing a local microbrew with pals, there's nothing like a night on the town to take your mind off school. UniversityHub asked over 1,000 students to rate their schools across several criteria, one of which was "restaurants and nightlife." We compiled a list of the top 10 schools below, and featured a hot spot from each one. Don't forget to explore the full rankings at UniversityHub.ca. Montreal is considered the hub of Canadian nightlife, with parties typically lasting until the wee hours of the morning. Along Saint-Laurent Boulevard, Factory shines bright like a diamond. With staff that should be walking a runway, an epic raw bar and house-made beer, this resto-bar is the place to get the party started. If you're a Ryerson student, eating at tasty Thai hot spot Salad King is a rite of passage. The mouth-watering menu has palate-pleasing dishes ranging from classic pad Thai to sizzling golden tofu, all in the budget-friendly price range of $4 to $10. For students who want to turn up the heat, you can customize your dish using the "spicy scale." Salad King is so ingrained in the Ryerson community that the restaurant has its own student award sponsored by its owners, Ernest and Linda Liu. The Salad King International Student Award celebrates the successes of full-time upper-year international students. If you like stomping your feet to live East Coast music and authentic maritime hospitality, The Lower Deck is the spot for you. Situated on the picturesque Halifax waterfront, The Lower Deck has local entertainment seven nights a week, making it a popular destination for students and locals since 1974. Maritime band Great Big Sea even got their start on its main stage. Whether you come solo or with a crew, you'll have new pals by the end of the night. Put on your comfy shoes, grab a beer and dance the night away. With overflowing mason jars of beer, foosball and pool tables, plus a crowd of young, vibrant patrons, Chainsaw is the local dive bar for WLU students. Everyone here seems to be interested in sharing a casual evening with their friends over daily specials and reasonably priced brews, including the Chainsaw Lager. With karaoke happening nearly every night of the week, you may just warm up those vocal chords enough to step on stage before convocation. Good entertainment and even better company make Chainsaw the place to be in Waterloo. Some bars are infamous and Stages, in the heart of Princess Street's bustling nightlife, is one of them. Almost every Queen's student has a story about a night out at this classic joint, which is typically the place to get your groove on from Thursday to Sunday. You'll see students of all years dancing to live DJs or older clientele staring creepily at the dance floor from the second level. The cons? Watered-down drinks, long lines and bouncers on a power trip. If you have the pleasure of spending the summer in K-Town, visit Stages for Monday night Beach Slam. Love shack, anyone? Everyone knows that a night at Stages wouldn't be complete without post-bar poutine at Bubba's. Joe Kool's is a London landmark and if you're new to town, or have lived there for decades, it never disappoints. Situated on Richmond Row, it's a great place to grab a casual dinner on the rooftop patio. If you need a place to kick back with your comrades, grab a pint and nosh the famous pizza that has the town talking. While it's popular with families during the week, students and young partygoers flock to Joe Kool's on the weekends. Lineups aren't a rare occurrence, so go early if you want to snag a prime spot. Café Campus situated on Prince Arthur Street is the go-to watering hole for Concordia students. It's cheap, cheerful and is a good time -- guaranteed. There are benefits to spending your night in this three-storey establishment. Feel like listening to live music? Or do you prefer busting a move to old-school hip-hop with flashy lighting and fog machines? This is the place where you can do it all on a dime. Going to school in Edmonton wouldn't be complete without a night out at Alberta's hottest country bar, Cook County Saloon. Adorned with all the country paraphernalia you could ever imagine and wait staff dressed like Daisy Duke, you'll be crooning like a country singer by the time you leave the bar. If you're feeling adventurous, enter the mechanical bull contest on "Bad Habit" Fridays and take a ride on the wild side. If you'd rather keep your feet on the ground, dust off those cowboy boots for the two-stepping contest every Saturday. Yee-haw! A short jaunt from campus, Victoria's Upstairs Cabaret has a buzzing nightlife, especially on Fridays for student night. Cover is $6 with a valid student card and the bartenders know how to make their patrons feel like VIPs. Like a chameleon, the venue changes from nightclub to bar to concert venue almost seamlessly. Whatever your reason for going, you'll always have fun -- even if you feel like a sardine. Who said attending university in the Prairies was dry? There sure isn't any drought when it comes to nightlife, especially at Amigos Cantina, where you can guarantee good food, good people and good music. The popular Mexican joint is famous for its delicious guac and overflowing burritos -- but order early to avoid long wait times. The music can get loud on the weekends, so pack your earplugs along with your sombrero.